Aschi's Workshop Newsletter #23 has a new FREE PLAN. Signe up for Aschi's Newsletter and receive FREE PLANS and lots of tips and info for FREE. 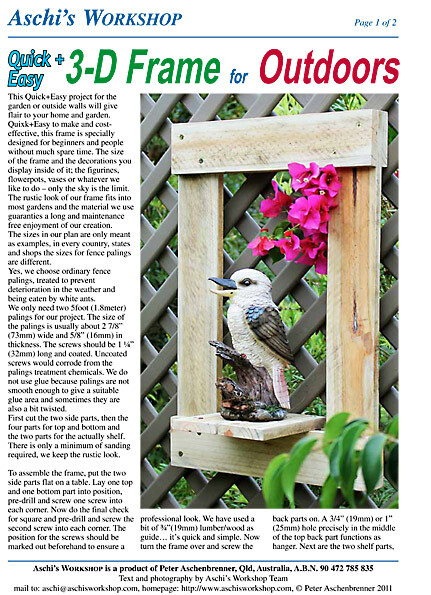 Click here and go to the web-page and signe for the Newsletter. 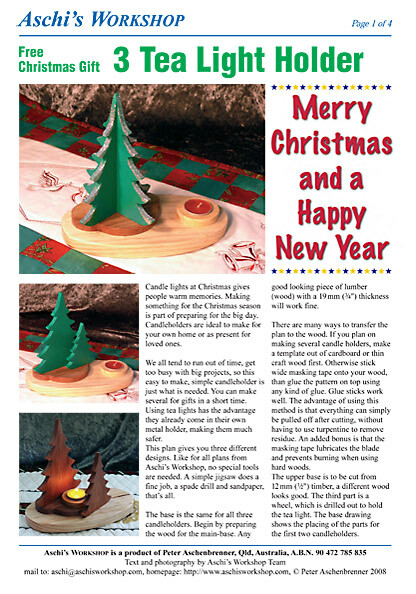 FREE PLANS from Aschi's Workshop. 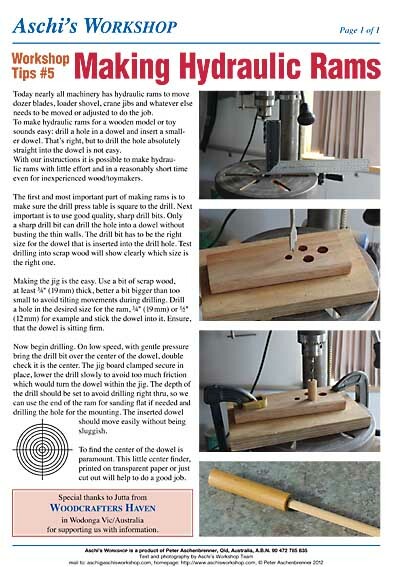 Shaping wheels is easy with this Drill Mount. Send e-mail to Aschi's Workshop and ask for the FREE PLAN. 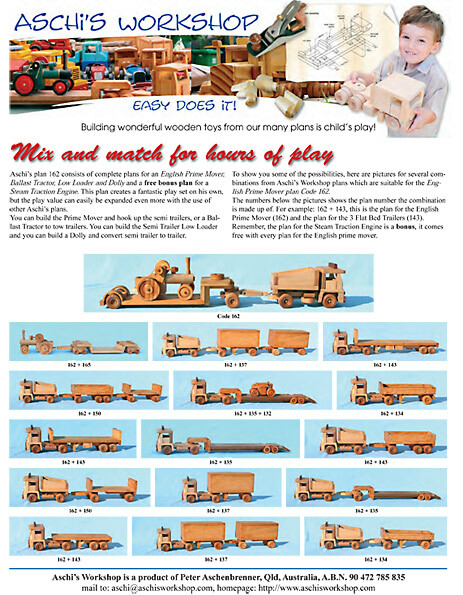 Aschi's Workshop has many Toy Plans for the beginner and also Model Plans yet easy to work with. 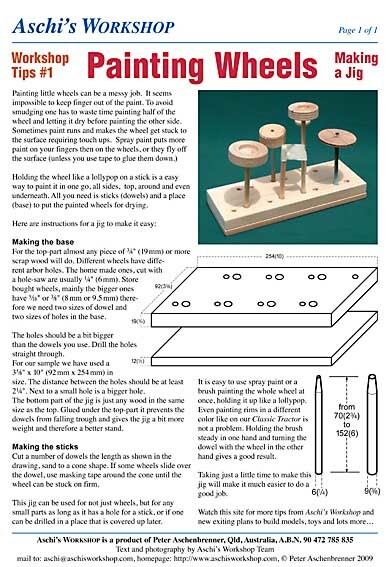 FREE PLANS from Aschi's Workshop to enhance the display and the play effect, Aschi has created a FREE PLAN for Poplar Tree's. The first in a series of tree's and accessories to come. Send Aschi's Workshop an e-mail and request your FEE PLAN today. FREE PLAN from Aschi's Workshop. 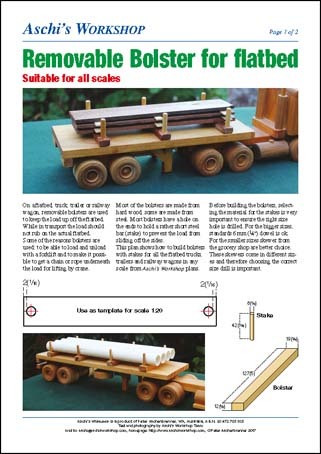 get for your TUFF TRUCK Series Trucks and for the G-Gauge railway. Having trouble ti find the center? not anymore. 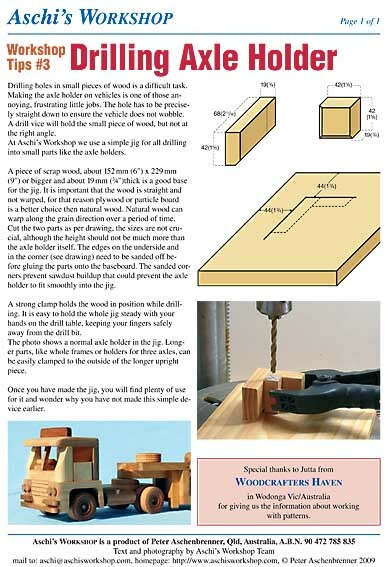 Make this simple tool from Aschi's Workshop Tips. Is so easy and quick to make. Aschi's Workshop has a number of Workshop Tips for you. All FREE !!! and only from Aschi's. One of the most versatile plan from Aschi's Workshop is the Plan #158. In Scale 1:27 it is not to big and easy to build. 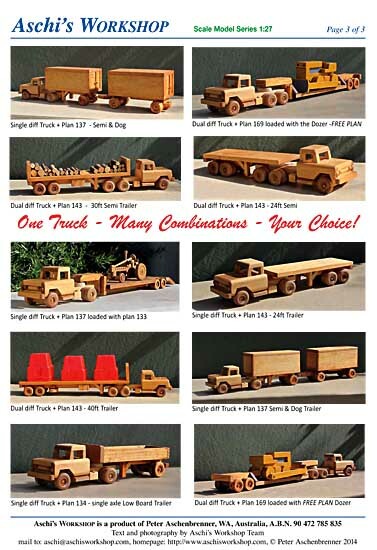 The Plan #158 has on his ohn already 4 different trucks, using this FREE PLAN for an conversion to an Tractor-Trailer extendes the posibilities to create your favorite combination of Truck n'Trailer. Get it today from Aschi's Workshop.... is FREE !!! Code: 509 FIRE TRUCK How big is the MINI Series ??? This plan answers your questions. 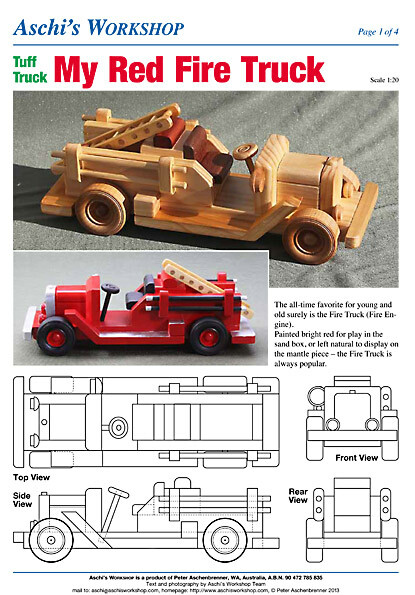 Get your FREE PLAN for this MINI Series Fire Truck. Click here and send a request for the FREE PLAN #509 to Aschi’s Workshop. You will receive an e-mail with the FREE PLAN in the attachment shortly. A FREE PLAN for the ever growing number of Aschi's MINI fans. Yard Refueling Station for many places in the heavy trucking industry. Is included in NEWSLETTER #10 or request from aschisworkshop.com. 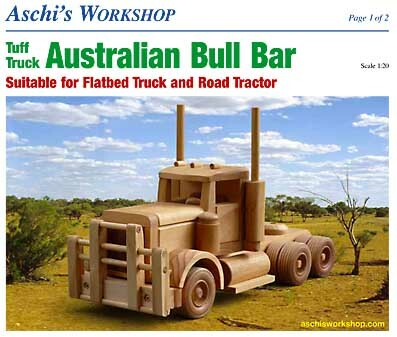 Aschi's Workshop has created plans for Australian Bull Bars for the trucks in scale 1:20 and 1:27. Send Aschi's Workshop an e-mail and request the FREE BULL BAR PLAN. Aschi will send them to you by e-mail and totally FREE. See also the FREE Workshop Plans, just click on. More about Aschi's Workshop, click here !!! 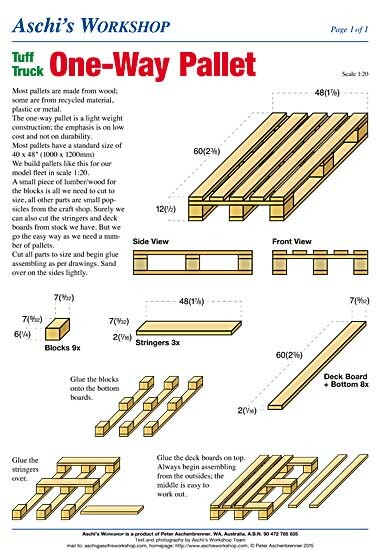 Free Dozer Plan from Aschi's Workshop. 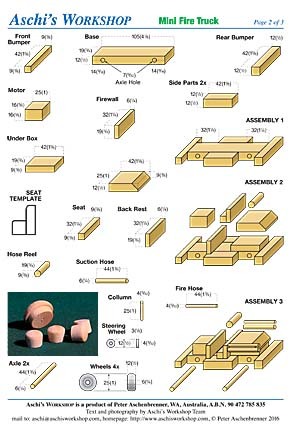 See for your self how easy Aschi's Wooden Toy Pattern are. Check it out, is free !!! A super plan for this Red Fire Truck from Aschi's Workshop. Request vom Aschis Workshop Web-Page today. Aschi's Workshop Models and Toys are to scale. You can mix and match models from the same scale as shown. The combination are endless, so is the fun. Aschi’s Workshop has a comprehensive number of Free Plans and Workshop Tips. Painting Wheels the easy way, Drilling Axle Holder ore Working with Patterns. 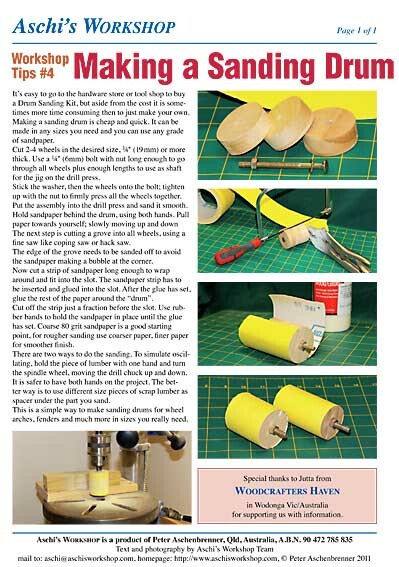 Aschi has Workshop tips which makes it easy. Most Workshop Tips can be downloaded for free and easy from Aschi’s Web-Page. 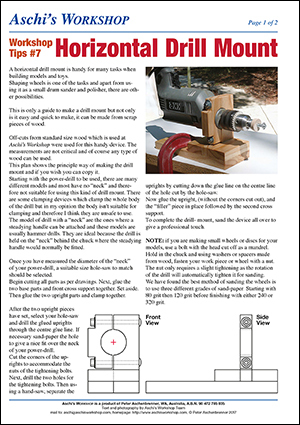 Making a Sanding Drum or Making Hydraulic Rams, Aschi's Workshop Tips makes it easy. Is Free and you will receive the plans by e-mail in less than 72 hours. How to make Wheels ?? with every FREE Plan or order, the WHEEL INSTRUCTION comes with for FREE. Aschi's Workshop has over 100 Plans. From Quick + Easy toys to quite involved models, yet easy to bild. Get your FREE PLANS now and find out how easy it is to make something special. 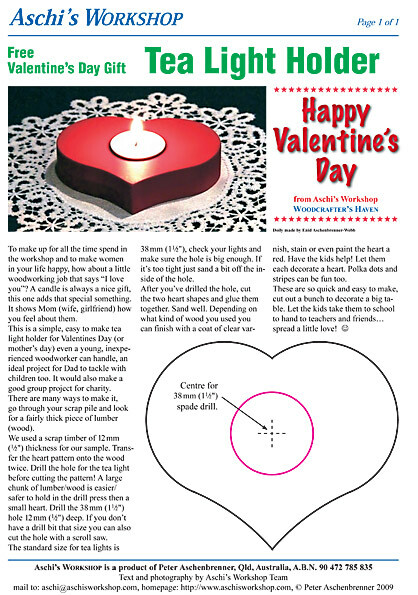 Tea Light Holder for Christmas or Valentine's Day, Pattern for decorative in-or outdoor stuff, check out Aschi's Workshop. Here are some Free Plans and Pattern for you to test Plans and Patterns from Aschi's Workshop. Go to Aschi's Web-Page, some are downloads, some you request by clicking. Aschi's Plans get delivered as PDF files by e-mail direct to you. no postage cost, no delay.Usually in less than 72 hours, the plans are in your inbox.